Appearing like a faerie ring there's an exploded circle of hay on a small green in Tackley village, a Giffords Circus A-board materialised at the centre to advertise their latest production: War and Peace at the Circus. Down the road, on the large green, the wagons are out in a circle, cream and maroon and cyan, and the white tent up, and children playing around, and performers about their business in full Russian and French military uniform. This is what Giffords just seem to get exactly right, by instinct or design: the strangeness and the frank, open realness of the travelling circus, which knows the value of transience and impermanence. Arguably it helps that they probably don't have so much to compete with, in Tackley, but it's in the small villages and towns of middle and western England that they've found a loyal and friendly audience. I've seen two Giffords shows now (last year, Yasmine) and, perhaps a little presumptuously, feel like I've got the measure of them: live music and ensemble singing; detailed work in costume, design and music embroidered within the fabric of linear storytelling; circus' dominant metaphors harnessed for narrative validation rather than subtler tonal qualities, and the lionization of the act/feat above the precise image-making most theatre-based circus is striving for; probably at least one goose. So perhaps there's a template, but they need something that fits: you could sort of see it as the circus, all of it, is the crown and the production is more a central jewel that's set, then prised from its socket at the end of each year. 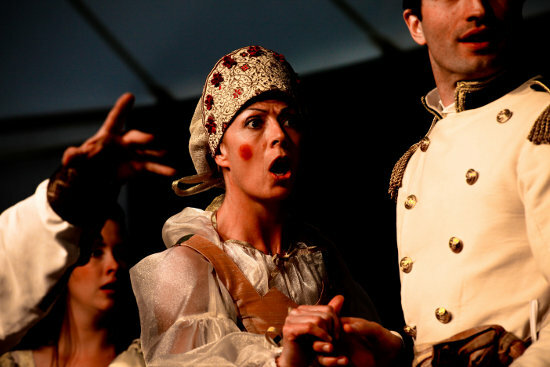 War and Peace is an adaptation of Tolstoy's novel, written and directed by Irina Brown, setting circus performers alongside actors. Long-time Giffords associate Tweedy – whose special clown power seems to be sending children into an agitated rage because they can see his hat's on upside down – plays an average joe soldier, close to the age-old role of audience guide or confidante. The other circus artists get slotted in without much of a hitch. On Natasha Rostova's name-day her gift is a performance from Pat and Kate Bradford – Pat, heavily made-up and probably just a month shy of the full, flowing mullet his performance style surely demands, tap dances in a handstand, while moving down some stairs, impressively; lovely jugglers Bibi and Bichu are drunk soldiers playing games, while more drunk soldiers (it's a motif) challenge each other to down a bottle in the time they can hang from one arm at the top of the tent; a stiff, capering Napoleon (Tamerlan Tsoraev) throws knives into the map he dances round. It's been the production's choice to focus on a straightforward run through the major events of the novel rather than to distil and translate its character, and a lot of what I associate with Tolstoy and that era of Russian literature – seriousness of sentiment; deep ethical rigour; a constant, penetrating, almost tedious, human insight – just isn't there. What you have instead I think is the narrative equivalent of a quick change act, whipping from one scene to the next, which will be hard to follow if you're not familiar with the novel (some of the plot is shunted out in ensemble songs, which have clever lyrics, written by Kit Hesketh-Harvey, but which are extremely hard to catch – perhaps because not all the cast are trained as singers, perhaps because of the acoustics of the tent). In the end, mostly, it works fine so long as you bear in mind it's more Giffords than Tolstoy, and is, as they say, War and Peace at the Circus.